Great post Mack! There's no question that the information and ideas you offer on your blog, on Twitter, on #blogchat and at speaking events is extremely valuable and you have certainly earned the right to to be compensated for your time (IMO you should be well compensated for your time given your expertise and the value of the information you convey). That being said, for less established marketer, bloggers, social media-types (the up and comers that are interested in building authority and credibility), do you think that it is worthwhile to take speaking opportunities that come your way even if you have to dig into your own pocket for travel, etc? 100% in agreement with this one Mack. I simply can't believe that many organizers expect the benefits of putting in such effort to be worth it based on referrals or other work that is generated by "Free" presentations. In fact, those free presentations are often terrible because the poor gal up front presenting has to "sell" something in order to justify being there in the first place. Note to organizers, you don't work for free, neither do we. Kristen I totally get that you might want to speak for free if you are trying to establish yourself. But if you start having to sell out $1,000 a pop in travel to speak at an event, it's going to be tough to make it worthwhile, unless you can stick around and do some serious networking. And even then, you need to be networking with the right crowd. One thing I would suggest for people that want to get started in speaking is to focus on speaking at events that they were already planning on attending. 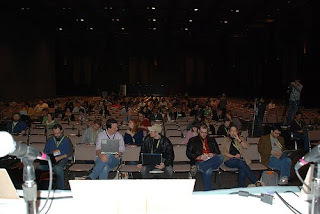 For example, if you know you want to go to Blog World Expo in the fall, contact the event organizers (@jasonfalls and @genuine both help with that) and see if there's a session you can either lead, or a panel you can join. Or if you know that a friend already has a panel, see if you can join them. Hopefully, you live in a larger area than I do, that has social media events frequently. If that's the case, start attending these local events, and strike up a conversation with the organizers, let them know who you are, and that you are interested in speaking. Maybe they can find a spot for you? But to answer your original question, yes, I think it can be worthwhile to take unpaid speaking opportunities when you are trying to establish yourself. For example, I wasn't paid to speak at SXSW (they comped me a pass), but I was happy to do it because it's prestigious to say you've spoken at SXSW. "In fact, those free presentations are often terrible because the poor gal up front presenting has to "sell" something in order to justify being there in the first place." Hammer meets nail. And they focus the majority of their time creating the presentation on making sure their sales pitch is perfect, not that the content they will be presenting creates value for the audience. And too, these speakers usually leave as soon as they get off the stage, cause they had to foot their own travel, and can't afford to stay. One of the first events I spoke at covered all the speaker's travel. The organizer explained to me that they didn't want the speakers to worry about paying to get there, they wanted them to come, present, connect with the attendees, and have a good time. The event itself was 1000% better for everyone as a result. This is such a delicate issue, Mack, but I think you make a convincing argument. To Kristen: I think it's a great idea to accept some speaking gigs when you're just getting started, even if they don't compensate you as well as you'd like. You can build credibility, hone your presentations, learn how to work an audience, and improve your speaking. But, to Mack's point, there comes a time when you have to "graduate." You DO incur costs when preparing for and travelling to these events. Don't bleed yourself dry. And if you have to schlep across country, book a hotel room, rent a car, and pay for meals...Mack's right, that oughtta be covered. Hi Mack, great points made here. The only time I have spoken for free is at my alma mater when I still lived in the same town. Unless you are donating time to an organization/cause, or as you said planning on attending an event anyway, I think it's a mistake to give away your expertise for free. Your time and knowledge are worth something. Too often people believe that they are "not allowed" to charge when they are transitioning into a new area failing to account for the knowledge and expertise that they possess. I do most of my speaking at company events where this is not a problem at all. Just as it would be unthinkable for the company to ask an I.T. guy to come in and work on the computers for free -- it's unthinkable for them to ask someone to speak at their corporate event for free. But at a conference, if I pay my own travel and you don't pay me, I'm not a speaker - I'm an enslaved attendee. This is not just a problem in social media world, but across the entire professional conference spectrum. As Mack says, there's alot of time and investment put into providing a good talk. People think you're just working for an hour while you're onstage, but you're actually working for several days. For speakers who will speak for free, let me say this: You deflate your own brand when you speak for free. When you give it away, you'll have a hard time charging for it later on. And while I won't speak for free, I do offer a (sometimes greatly) reduced fee for non-profits, groups, or small companies who can't afford my normal fee because speaking does have promotional value for me. Plus I sometimes enjoy those events more because the people seem to want to learn more. But basic travel (get me there and a place to sleep) is a bare minimum for any speaker. For conference organizers, remember you get what you pay for. I've been on the planning end of conferences and know how tight budgets can be, but ... that's why you have a budget. Plan accordingly, and if you plan to bring in national/regional speakers, you darn well better be prepared to cover their out-of-pocket expenses, at a minimum. It's the right thing to do. And, presenters should not have to feel uncomfortable placing that as a requirement. The right presenters on the bill will help sell conference registrations. Plan it right, budget accordingly, and roll out the red carpet for those who put in the time to deliver the goods. I agree with KaryD. It's all in the planning and budgeting. As an organizer, covering the expenses of a speaker can be pretty easily handled by procuring a special sponsor or by slightly raising sponsorship levels across the board. That's the professional way to operate as opposed to expecting an individual to shoulder the financial burden of bringing value to the event. Ultimately, speaker compensation is dependent on the attitude and operating principles of the organizer. It's really not necessary for an organizer to stiff anyone if they value people and plan properly. As a conference host, I am paying my speakers, their travel, hotel, and food. I applaud you for writing this post! I just realized my last comment may have come off like, "I'm so great, I pay my speakers." That's not what I meant to convey...I just agree with you! I agree that all speakers at conferences need to be paid so they will have the motivation to create a unique, educational experience. For people just getting started in public speaking, there are many local groups and organizations that use local speakers. It still takes making a good pitch, but there is practically no cost to present. Agreed. Event organizers have so many creative options for making sure the speakers/presenters are taken care of well. Like @michelletripp said, sponsorship is one; it's a win all around. It is also crucial to the branding of the [recurring] event to have quality, well prepared, and relevant speakers who leave excited to have been invited & whose audience leaves excited to have been there. It cycles back to the sponsorship of the next event, and provides valuable marketing material in the interim, for the event organizer(s), the speaker, and the sponsors. For smaller events, especially in small towns, finding a host for the speaker is one idea that can work well, and often begins a life-long friendship. @SarahMae: I took your comment to mean that you value the speakers you bring. I'm sure that's appreciated. An interesting angle to me on this topic is the corporate presentation giver. Thought leadership and "free publicity" seem to be overvalued within the ranks of the large organization, when they could potentially tap into another revenue stream from their associates' speaking engagements. Good for you Mack. Folks like us are all too often more than willing to give away our advise and expertis. Unfortunately, it's meant we sacrifice the prospect of making a decent living in the process. Like you, I'm not doing free any longer and, very, very rarely, even expense only. My time and knowledge is worth something. Besides, I do a pretty decent job of presenting too. That, in and of itself, is worth something. Okay, the last comment was from Paul Chaney, even though it registered as anonymous. Congrats Mack! That is so true with the amount of time that speaking takes. And the fact that you take so much time and care to make it the best content, demonstrates the value that you provide to the conference. Thanks for the thoughtful response and the good ideas for building up a foundation as a speaker at events. Sometimes we introverts have to push ourselves to put ourselves out there publicly in the first place and asking for money to do so complicates things further, but your points are well taken. I have done my fair share of "freebies" to prove my worth and the more people we get to value their time and understand this, the better it will be for everyone. Thanks for the comments and RTs on Twitter guys! As a professional educator and conference organizer, I totally agree with you. You as the content expert speaker deserve to have your travel, expenses and lodging covered, at a minimum, especially if I've asked you to present. If I've asked you to present, I probably have done my homework to see how you've faired in past presentations, if your past clients would rehire you and if audiences have been pleased with your content and delivery. In the education world, we typically say each one hour of presentation takes six to eight hours of preparation, the first time. If that presentation is presented again, it only takes about three hours of prep for each hour of presentation. As a conference organizer, I invest a lot too. I'm willing to market you, your presentation and your company. I'm willing to tell my attendees why they should hear you as a speaker, what's in it for them and why it will be a good use of their hour. So both the speaker and I have put ourselves at some risk. I'm usually willing to pay an agreed upon fee as long as the speaker agrees upon a performance clause in their contract establishing a baseline of performance expectation. I'll pay the full agreed-upon fee assuming the speaker gets a least an 80% overall average favorable on the attendee evaluations. I'll include an incentive clause that if the speaker scores a 90% overall average favorable, I'll provide a bonus of a specified amount. 95% overall and it's a higher bonus. Naturally, I'll let my speakers see the evaluation form and explain the process so that we are all on the same page. Why do I do this? In my past, I've paid fees and covered travel, expenses and lodging for speakers to deliver a great home run presentation and they failed. The speaker was a great thought leader with poor delivery skills and the audience didn't like them. So, I'm willing to take the risk if the speaker is willing to take the risk. That way we are both covered. Jeff I have a friend that does exactly that. They charge high 5-figures to speak, but if the attendees don't give them at least 4 out of 5 stars, they don't get paid. I think it's an interesting idea, and I think your tiered payment structure benefits all. Totally agree, Mack, as most who have commented. Our intellectual property is ours. Most of us attend local social media events, write blog posts, and share information freely about our business and experiences. But when it comes to someone (a company or event organizer) profiting from our presentation of knowledge, it's time to pay the presenters. I remember when I, as a CEO, began charging for delivery of presentations. It upset a lot of people. But even more people appreciated and understood the situation. As I think back over the years, the folks that ever got upset were the same that always wanted free stuff in their lives. Keep on doing what you're doing. We appreciate you! Good thing I've bumped into this post and I learned many things about speaking in public. Keep up the good work and thanks for sharing your experience with us. It is always shocking to me that people even consider a speaker to come do a free talk. There is a reason that they want you to talk, and they know it takes work to get a quality presentation out there. I brush off any offers that include nothing right away. Not even considered. If it is a charity or non-profit that I believe in I may choose to donate my honorarium, but they always still offer. Good for you, Mack. Instructive for writers like myself, as well. It's really easy--seductive, even--to give away your best work these days. Competent amateur writers fall all over themselves offering their work, free of charge, to all sorts of big-name websites. Which means that it's much more difficult for professional writers to make a living. We're actually providing gasoline for the engine of culture. We should be getting paid for our work. Maybe information wants to be free, but great content is more than "information." I used to be a shy introvert, unable to speak properly in front of audience. For survivor sake, I have decided to learn the art of public speaking.. It's been 3 years and I must say that I have improve a lot. It also help to build up my self esteem, confidence and everything. Happy to hear another good leading example of before and after. All the best dude! Yes, as a professional speaker myself, it is SUCH a labor intensive time commitment. As a fellow introvert, have you tried Toastmasters? Whenever I've been asked to speak for free, my thought--not expressed to the caller--is "if it's worth nothing to you, then it's worth nothing to me, either." Great post Mack ! We have to act now ! !